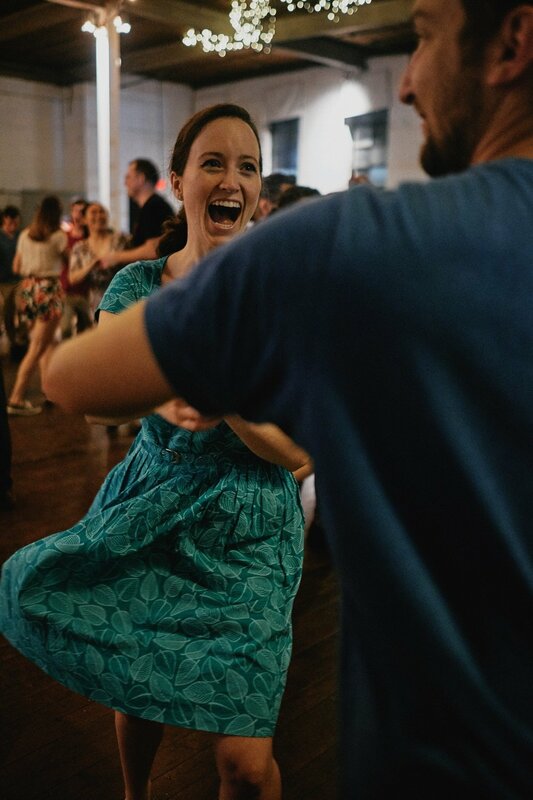 We’re spreading the joy of swing dance in the Atlanta community. Hot Jam is a social dancing event with a free beginner lesson to get you grooving with the local dance scene of Atlanta. Hot Jam is a weekly swing dance held in a warehouse in Atlanta. We're run by a slightly off-kilter group of swing dancers, for a slightly off-kilter group of swing dancers. Its relaxed and inviting atmosphere. The wide variety of dance levels, from absolute beginners to advanced. The highly danceable wood floor, where people dance Lindy Hop, Balboa, Blues, Charleston, and Collegiate Shag. Experienced DJs playing the classic swing favorites of Count Basie, Benny Goodman, Sidney Bechet, and many more. Hot Jam is dedicated to providing a safe and comfortable event experience for everyone, regardless of gender, age, sexual orientation, ability, physical appearance, body size, race, or religion (or lack thereof). We do not tolerate harassment of event participants in any form. Sexual language and imagery is not appropriate for any event venue, including dances, workshops, competitions, Twitter, Facebook, and other online media. Event participants violating these rules may be sanctioned or expelled from the event without a refund at the discretion of the event organizers.